On Equal Pay Day, the day in the year that women stop earning relative to men, the MPG-backed Parental Pay Equality have published an open letter to the Prime Minister calling to extend the new Shared Parental Pay Benefit to the self-employed. Members of Coldplay and Keane, singer-songwriter Laura Marling, classical string-quartet Bond, film director Tim Burton and composers Stephen Warbeck (Captain Corelli’s Mandolin) and David Arnold (James Bond, Sherlock), together with over 30 MPs from all 4 major political parties are amongst the signatories of our open letter calling to extend the new Shared Parental Pay Benefit to the self-employed. Under current rules men are ineligible for any kind of paternity or parental pay, thus forcing mothers into being the main caregiver. This lack of flexibility, combined with strict rules about working whilst on maternity leave are a barrier to women succeeding in freelance careers, and penalise fathers for taking an active role in parenting.Most of the MPG membership is self-employed, and we are proud to have signed this important letter. London, UK: November 9th 2017: Members of Coldplay and Keane, singer-songwriter Laura Marling, classical string-quartet Bond, film director Tim Burton and composers Stephen Warbeck (Captain Corelli’s Mandolin) and David Arnold (James Bond, Sherlock), together with over 30 MPs from all 4 major political parties are amongst the signatories of an open letter calling to extend the new Shared Parental Pay Benefit to the self-employed. The letter describes Maternity Allowance as placing the entire burden of childcare on the mother and points out that self-employed fathers and adopters get nothing. 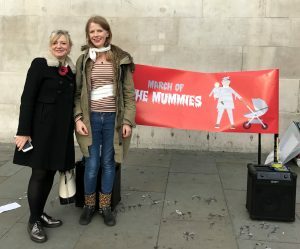 Last week, cities across the UK saw 5 maternity and paternity–related demands, including shared parental pay for the self-employed, made in a ghoulish fashion, as protesters in Halloween fancy-dress marched on parliament for March Of The Mummies. The following day Tracy Brabin MP referenced the march in her PMQ on shared parental pay for the self-employed, and the Prime minister promised to look into it. Parental Pay Equality, the campaign group behind the letter is the brainchild of award-winning sound-engineer, Olga FitzRoy, and is supported by industry organisations the Music Producers Guild and UK Music. “Equal Pay Day is the day in the year that women stop earning relative to men, and we are launching today to highlight the unfairness in the system. Our research shows 54% women’s businesses suffered as a result of not being able to share leave – surely the time has come for change.” says FitzRoy.